Within Germany’s industry the issue of environmental protection has increased in importance within recent years. A distinct indicator to support this thesis is the voluntary participation in the implementation of the EMAS by more than 2000 company sites. One reason for this is a shift in the perception of industrial environmental protection over the past years. Previous environmental protection was mostly sensed as a bureaucratic burden. Today, the enterprises take an active part in using environmental protection successfully for achieving company business aims by setting-up environmental management systems. This chapter focuses on the issue of material flow management as an approach to optimise a company’s economical and environmental performance. Material flow management comprises the identification, analysis and optimisation of procurement, usage, handling, transformation and disposal of all physical goods within a company. A physical good in the context of material flow management does not only comprise raw materials and semi-finished products but especially all those materials that have not been dealt with in common management and information systems such as waste, energy, commodities, etc. This chapter describes contents and potentials of material flow management. 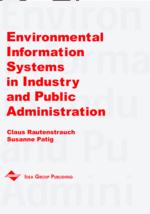 It especially contains a description of the specification and introduction of an Environmental Management Information Systems (EMIS) which offers special support in the area of material flow management to a machine building company.